Addressing the event, NA President de Rugy said Vietnam and France set up diplomatic ties on April 13, 1973, opening up a new page in the bilateral relationship. In the following years, France overcame difficulties to accompany Vietnam during the country’s struggle for national liberation and national reunification. The legislator affirmed that Vietnam is France’s important partner in Southeast Asia which is developing dynamically. In 2013, the two countries signed a strategic partnership and cooperated in various realms, from politics to economics, culture, education, science, the parliamentary channel, military and strategy. The French leader described Vietnam as a pillar of the Association of Southeast Asian Nations (ASEAN) with high growth, adding that the country’s GDP increased 15 times over the past 30 years. He highlighted the increasing presence of French businesses in Vietnam, as well as the number of up to about 7,000 Vietnamese students in France. Besides, Vietnam and France have joined hands in coping with global challenges such as climate change in the Mekong and Red River Deltas, the leader said. In his remarks, Party General Secretary Trong emphasised that since the two countries established diplomatic ties 45 years ago, France has remained Vietnam’s leading partner in Europe and the world at large. The Vietnam-France relationship is always among the priorities of Vietnam’s foreign policy, he stated. 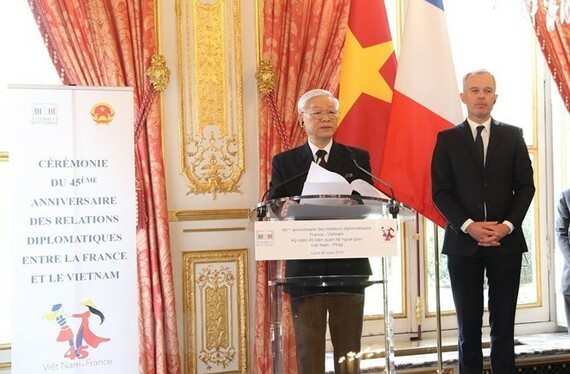 Trong stressed diverse cooperation between Vietnam and France, both bilaterally and multilaterally, allowing the two countries to consult each other and share their viewpoints on many regional and international issues. He also noted the diverse exchange of culture between the two countries over the past time. France is not only Vietnam’s leading European sponsor but also its cooperation partner in various spheres, the Party chief said, adding that priorities have been given to bilateral collaboration in education and scientific research. He cited hundreds of agreements signed between Vietnamese and French universities and research institutes. Cooperation between the two countries’ localities has also been expanded with the participation of 20 French localities and 15 cities and provinces of Vietnam. Vietnam and France established a strategic partnership five years ago, demonstrating their mutual political trust, he said, underlining enhanced bilateral coordination in regional and international issues. Party General Secretary Trong called on the two countries to scale up efforts in order to deepen the strategic partnership, increase their political trust and high-level exchanges and meetings, improve the efficiency of dialogue and cooperation mechanisms, step up affiliation in all fields, expand people-to-people exchange, enhance cooperation between localities and intensify coordination in regional and international issues of shared concern. The two leaders then witnessed the signing of six cooperation documents, comprising a letter of intention on universe technology between Vietnam’s Ministry of Science and Technology and France’s Airbus Defence and Space, a cooperation programme in 2018 between Vietnam’s Justice Ministry and the Supreme Council of Notary of France , a the agreement on research and planning of maritime natural resources between Vietnam’s Academy of Science and Technology and the French Research Institute for Development. The others are a memorandum of understanding on cooperation in intellectual property between Vietnam’s Intellectual Property Department and France’s National Industrial Property Institute, an agreement between Vietnam Airlines and Air France and Air France Industry KLM Engineering and Maintenance of France, and anther MoU on purchasing 24 aircraft between Bamboo Airline, FLC of Vietnam and France’s Airbus.